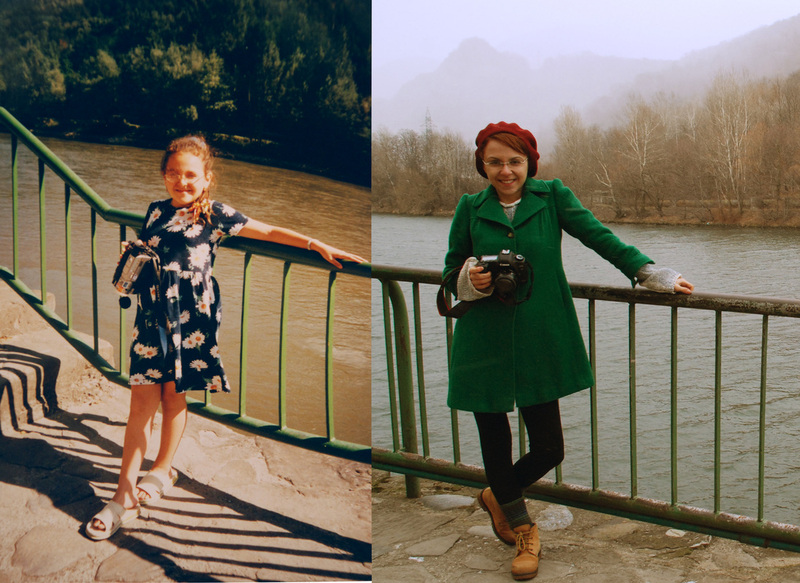 My portraits made by my father in the same place, 10 years difference (2004-2014). In the first picture I have 14 years old and it was the moment I fell in love with a video-camera. ​​I am a Romanian freelance filmmaker interested in documentary film, social impact and new media. I finished the grade school at UBB (FTT), department of Cinematography, Photography and Media in Cluj-Napoca (RO) where I’ve gained a multicultural academic background by having a double scholarship experience in South Korea and Turkey. During my studies at the Master of Photography and Dynamic Image at UNARTE Bucharest (RO) I had another scholarship in Valencia (SP). Besides the academic life, I've had many highly-improving experiences, as resident artist in France, Sweden and Italy. Maybe the most highly-improving experiences for me were the participations at workshops around the world, like: Aristoteles (RO), Storydoc (GR-DE), Nisimasa Experimental Film (RO), Interaction Film Camp (RS), Bodyparts-Dance and Video (RO), LongocampoDOX (RO), Transylvania Talent Lab (RO), Documentary Filmmaker’s Developer Toolkit - meeting sessions (RO), VFF - Visegrad Film Forum (SK) and different film forums and film markets. My last documentary film As You Like It was officially selected in over 40 festivals around the world festivals like: Karlovy-Vary, DOK Leipzig , TIFF Romania, documentART, Cannes Short Film Corner etc, winning awards like: best image, best social documentary, public prize and best short film. Besides this, I have to mention a special award for me, which is the Special Mention for Academic Excellence by the League of Romanian Students Abroad. I worked as a social impact designer (a_BAHN Luxembourg), multimedia coordinator (4 Culture Association), film editor (Fantascope Films, Little Stars Film School, independent projects, like The Ark and The Japanese Quince Tree), cinematographer (films: As You Like It, The Manakia Brothers and Resolutions 2014) and maybe the most important, as a director (films: 4GenWomen, As You Like It, Connection Lost etc, video-installations: Mirador, Skype Virtual Installation and Site Under Construction - collaboration). I am still active in all the fields listed above, with a focus on cinematography and I am open to creative collaboration all around the world. As a filmmaker and documentary film-researcher, I had one main ambition which motivated me so far, which is the continuous, tireless curiosity and the search for new ways of stimulating my own creative thinking. That's why I choose to travel in a wide range of environments. My works are generally social films, as I found people as being fascinating, with their beauty, so-called "ugliness", weakness, masks and incredible creative power. Traveling and developing projects in different countries expanded my awareness and introduced me to a greater diversity of mentalities, which allows me to analyze and compare patterns and routines, a great source for my projects. I have a great interest in both linear and nonlinear visual storytelling, exploring terms like web-documentary, cine-performance, live-documentary, live-video installation ... They are just different forms given to the ideas, depending on what fits best to the content. At the end, these are just gifts that we, as visual storytellers, make to ourselves and to the world. CFM unplugged from Teatrutv on Vimeo.